Right now, Volkswagen offers three SUVs for the American market: the Touareg (dead), the Atlas and the Tiguan. And as you already know, Americans can’t get enough of these SUV things. So why doesn’t Volkswagen seem like it has plans to offer the new, 2018 Volkswagen T-Roc compact SUV/crossover to us Americans? I’d wager the T-Roc would do pretty well here. It’s certainly a handsome crossover. I’m really digging the two-tone color scheme. It’ll slot beneath the Tiguan in the VW family lineup, riding on the same MQB platform that the Atlas does. They are being offered partly with front-wheel drive and manual gearbox, partly with front-wheel drive, 4Motion all-wheel drive (including 4Motion Active Control as standard) and the dual clutch gearbox (7-speed DSG). Emphasis mine. Did you see that? A manual option!?!??! I know from reading your comments enough that a lot of you would jump on the opportunity for a manual crossover. ARE YOU SEEING WHAT I AM SEEING!!!??? 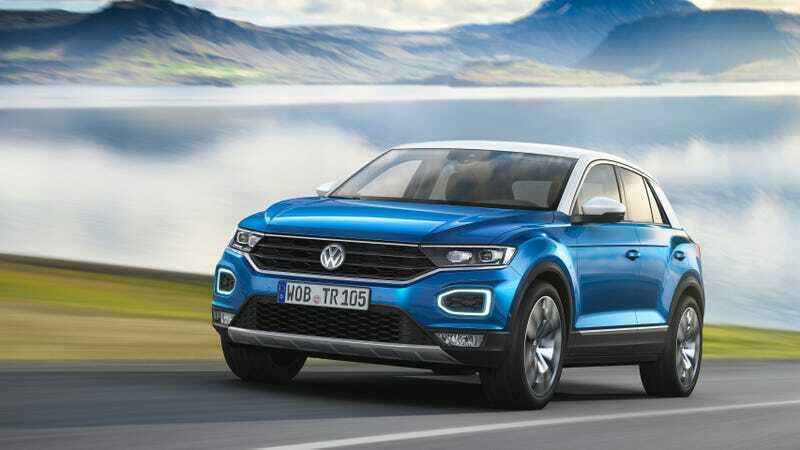 In the German market, the T-Roc will occupy the €20,000 slot ($24,000). There’s mention of a European launch in November—and then nothing else about an American launch. There are “no plans for entry into the U.S. market at this time,” writes Automobile Magazine. So then bring it here! Bring it to the people who are buying SUVs like the world is going to end. We have reached out to Volkswagen for comment and will update if we hear back. Update: A Volkswagen spokesperson confirmed that the company has no plans whatsoever to bring the T-Roc to America. Sad!